When Thailand tours offer to take you to the floating market, they are often referring to Damnoen Saduak Floating Market, which is probably the most popular floating market in Thailand. Being the most popular also means that it is often the most crowded and less authentic than some of its lesser known alternatives. We will cover 3 different floating markets in this article. 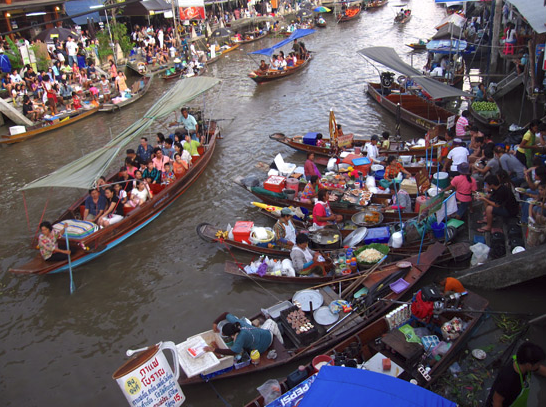 The Damnoen Saduak Floating Market is arguably the most famous floating market in the world. The market was originally created as part of a canal during the reign of King Rama IV for transportation purposes. Today, the canal has been transformed market consists that consists of mainly of farmers selling all types of fruits and vegetables that are grown in the area. Since the market has grown in popularity, there are also boats that sell other items and souvenirs for tourists as well. The Damnoen Saduak Floating Market is located in the Ratchaburi province, which is about 100 kilometers southwest of Bangkok, Thailand. From Bangkok, you can get there by taking a public bus from the Southern Bus Terminal for about 50 Baht one-way. The buses leave the terminal approximately every 40 minutes starting from 6AM onward. The market is usually open from 7AM to 11AM daily, but it is best to get there early to beat the crowds and the heat. Alternatively, if you don’t want to try to get to the Damnoen Saduak Floating Market on your own, you can always take the Damnoen Saduak Floating Market Tour. One alternative to the Damnoen Saduak Floating Market is the nearby Tha Kha Floating Market. The Tha Kha Floating Market is about 10 kilometers away from the Damnoen Saduak Floating Market, but it is almost an entirely different experience. The Tha Kha Floating Market is much smaller than the Damnoen Saduak, and is definitely quieter and less touristy as well. They still use the traditional wooden row boats here as opposed to the ones with the motors that are often found in Damnoen Saduak. The Tha Kha Floating Market is usually open on the weekends and the weekday availability varies. 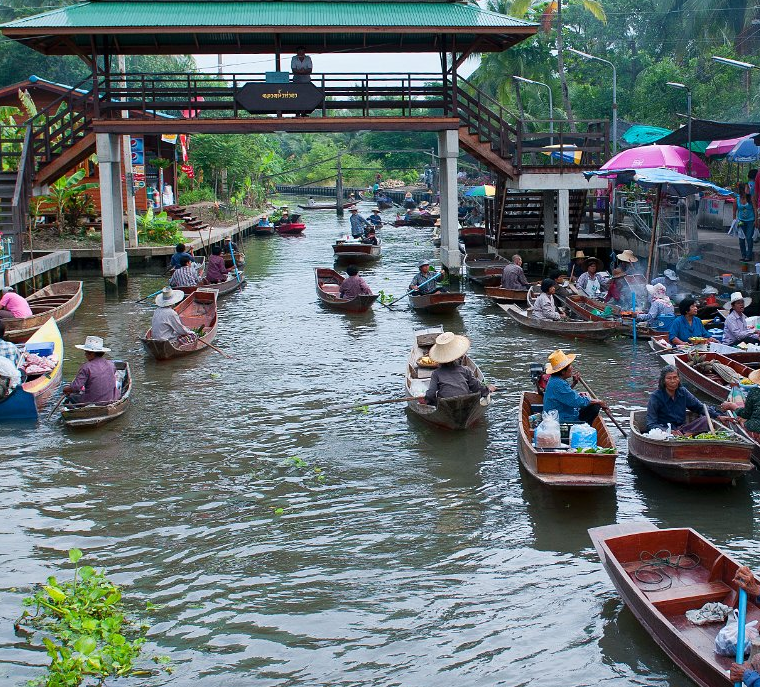 Another alternative to the Damnoen Saduak Floating Market is the Amphawa Floating Market. The Amphawa Floating Market is the second most popular floating market near Bangkok, but it is not as large as the Damnoen Saduak Floating Market. The Amphawa Floating Market is known for selling seafood which is often grilled right in front of you. Unfortunately, the Amphawa Floating Market is open on weekends only, which often means that there are a large number of visitors, but they are mostly from Bangkok and there are less tourists than at Damnoen Suduak. Here is the link for the Damnoen Saduak Floating Market Tour.